Wethersfield Connecticut is the next Santa Fe. 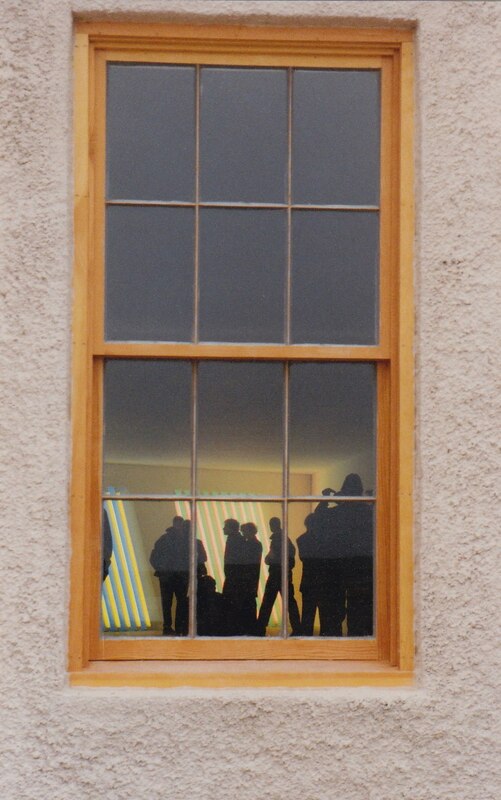 Lots of places have been similarly acclaimed, and Mars and I have been to at least one of them - Marfa Texas. We also are frequent visitors to the flourishing, artistic New Mexican village that they all seek to emulate, and where daughter-in-law and son reside. That is as much experience in this subject matter as you are likely to find in our neck of the woods. Like many catchphrases, "tnSF" is deliberately ambiguous. At least one of its meanings is that a locality successfully uses culture to drive commerce - something that the capitol of New Mexico does with it's blending of fine art, Native American crafts, and museums. Another connotation is that a city has sold-out its unique, natural identity to become a faux-artsy, fancy-schmancy tourist destination run by outsiders. 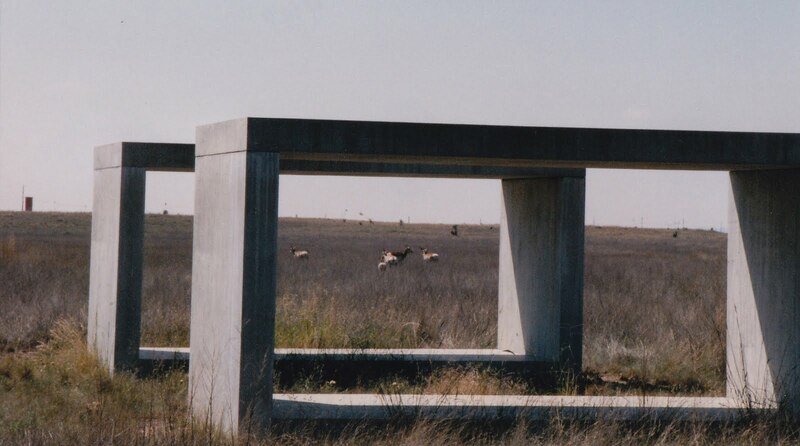 Marfa was just a small sun-blistered, desert-dry, West Texas town in the 1970's when eminent and successful New York minimalist artist Donald Judd moved there - purchasing an entire decommissioned Army base with sixteen dilapidated buildings on which he established his Chinati Art Foundation. Twenty-plus years later the artists and enterprisers arrived. "They're championing the community as a rising colony of creativity, not to mention a pleasant weekend getaway-if you have a private jet. 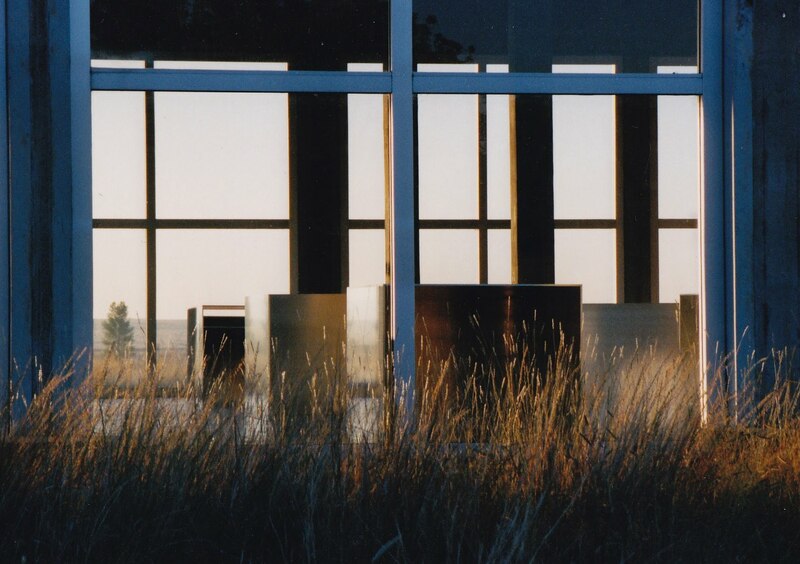 Many even say it's the next Santa Fe-not too far-fetched a comparison, since Marfa has the same dry climate, the same sharp light, and the same blend of desert and mountains. 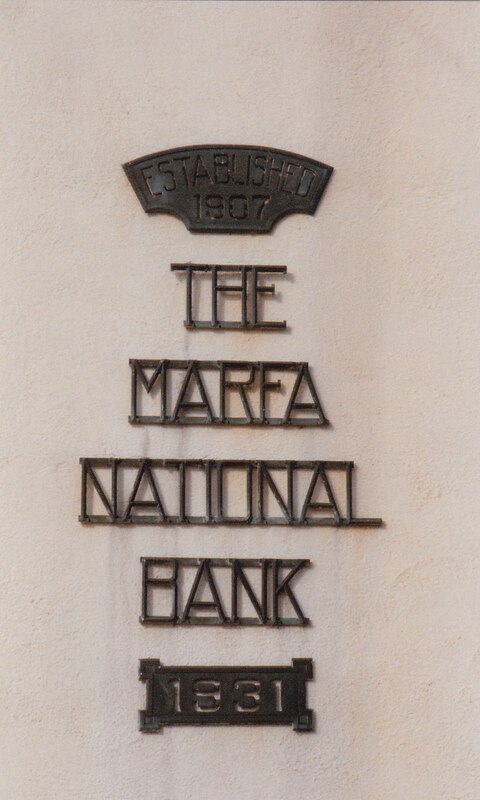 But a large percentage of Marfa residents think Santa Fe is horrible and that the kinds of people it attracts would reduce Marfa to a pop imitation of its former self. Which moves the old guard, which remembers it as a ranching town landlocked by cattle kingdoms the size of small states, to wonder what the hell is going on." Sounds exactly like Wethersfield to me - dwindled away dairy farms, rising colony of creativity, pleasant weekend getaway. And it is not just because of the revival of Comstock Ferre, located at the epicenter of the Connecticut's oldest and largest historic district. "The company, known for years as the country's oldest continuously operating seed company, closed in August 2009 after 189 years because annual sales were falling. But it will reopen next week under a new, historically minded owner - Jere Gettle, owner of a 12-year-old Missouri-based company called Baker Creek Heirloom Seeds. 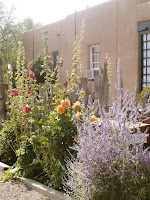 In fact those elements pale in comparison to the main thing that makes me believe our small settlement is well on its way to Santa Fe-ness - hollyhocks. 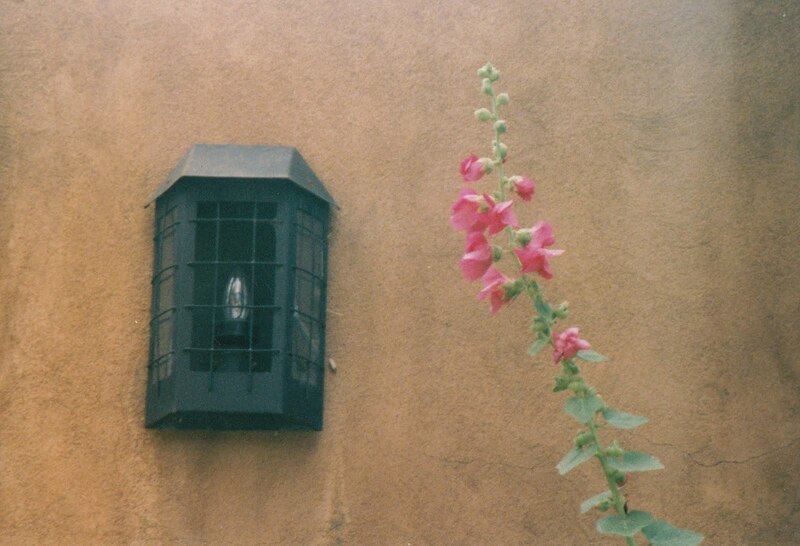 "Hollyhocks against an adobe wall may be Santa Fe's signature plant. Bees and butterflies love them and they come in a multitude of colors - pinks, reds, whites, almost black but never in blue. 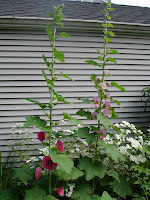 One garden writer describes hollyhocks as 'elegant in a wayward, random fashion.'" Actually that's an understatement. I would say that you couldn't swing a dead javelina in Santa Fe without hitting one of these drought-tolerant, heat-loving members of the mallow family - a diverse grouping that also includes hibiscus, cotton, and okra. 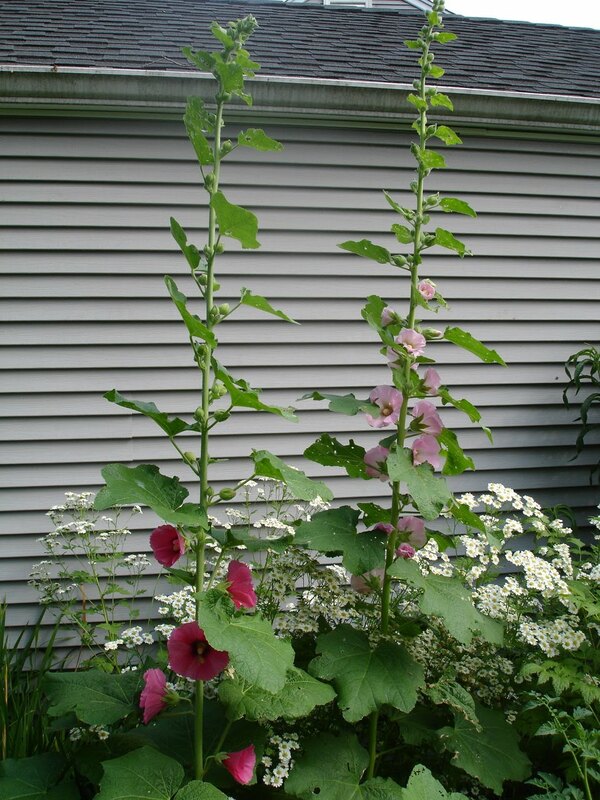 We had been told that hollyhocks could be finicky starters - that they might be biennials, triennials, or one-season perennials. They also are subject to rust - brown spots on yellow, sick-looking leaves. The first growing season a couple of them poked their heads a few inches above ground, apparently decided they didn't like what they saw, and just hung out at that height, in that flowerless state, for the duration. That autumn Mars appropriated some more seeds. 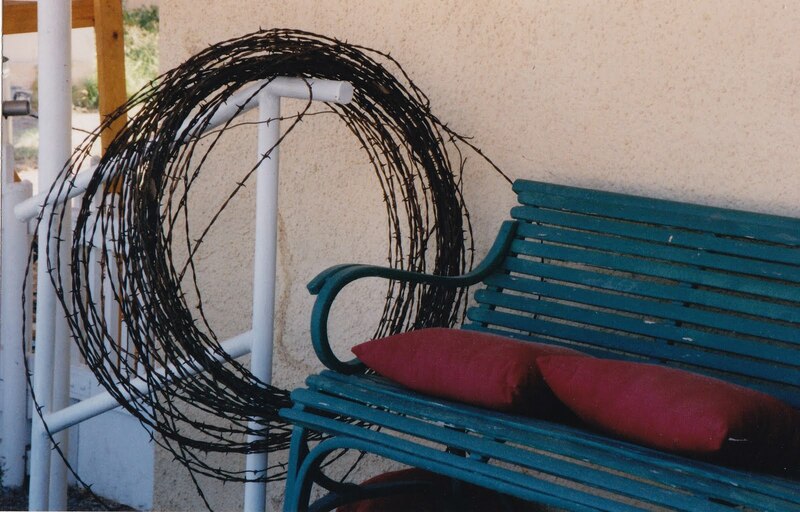 Last spring they reappeared, and seemed to be going great guns (getting tall, showing buds) until an unanticipated monsoon season overwhelmed their vascular systems with too much H2O and drowned them. Not to be deterred, Mars repeated the southwest to northeast transplant ritual one more time. This spring there was the average 3-4" of rain per month. Then, shortly after my newly acquired rain barrel got to be three quarters full - all precipitation halted. Now a duo of hollyhocks has shot up to N.B.A. heights, with buds and flowers sprouting out of every pore. Other momentarily shorter ones are beginning their ascent. 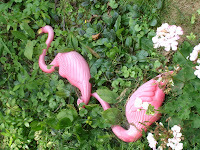 One could be an aberration; two is a trend; but three or more is definitely a movement. They self-seed. 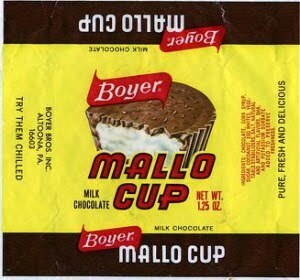 And, as we have seen on our property with other seed-droppers, with the help of resident squirrels and birds these magnificent mallows will soon be dominating the landscape throughout our tiny hamlet. There also is word that our town's newest seed merchant will be attempting to revive the Wethersfield Red Onion - at one time the agricultural staple of our the local economy and now, in two dimensional form, our town emblem. 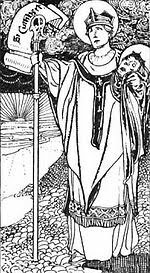 Soon, with globes of burgundy bulbs and towers of pink, white and red flowers decorating every vinyl wall in sight, our hometown will become the new Holy Grail of destination burgs. And Santa Fe will aspire to be the next Wethersfield. Being devotees of both cities, we can help. Mars will just have to leave a little room in her carry-on for a few onion seeds on our next flight out west.